Canadian dollar has gained momentum after the oil price growth. Furthermore USDCAD is affected by the US Nonfarm Productivity, US Unit Labor Costs and Canada Ivey PMI as well. This pair has been moving with bearish bias since the beginning of June. 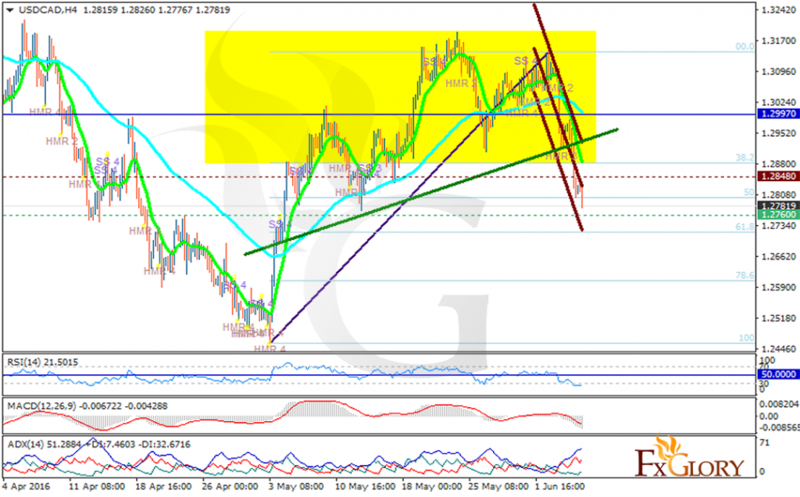 The support rests at 1.27600 with resistance at 1.28480 which both lines are below the weekly pivot point at 1.2997. The EMA of 10 is falling down sharply and is located below the EMA of 75. All indicators are giving strong sell signals; the MACD indicator is in negative territory, the RSI is below the 30 level and the ADX is showing strong sellers. However, considering the head and shoulder pattern there might be a rebound around the 61.8 of Fibonacci retracement. The pair might hit the support level but the reversal pattern will appear afterwards.